What should I NOT DO after my Hilot session? PASIG CITY, Philippines- There are many reasons why people seek out a good manghihilot.Some people need relief from pilay (sprain). Some want to ease chronic back pains. Some hope that traditional Hilot can help them get pregnant. Still others just want quick, effective relief from the stresses of working life. Quite a number of Filipinos have rediscovered Hilot’s potency for healing, and have integrated regular Hilot sessions into their weekly routines as treatment for chronic conditions such as diabetes, asthma, arthritis, as well as liver and kidney conditions, among others. Don’t take a bath or shower! This is the usually the first reminder your manghihilot will tell you, and is the most important, because taking a shower will neutralize the healing benefits of your traditional Hilot You can read more about this here. Don’t rush into the rain. Think raindrops pose no threat? Think again. Like tip number 1 above, the rain will get you wet and will have the same detrimental effects. If you need more convincing, pretend to rush out on a rainy day in full view of your She will probably freak out and do superhuman feats to prevent you from doing so. If you had Hilot because of a sprain or other muscle problem, don’t strain or stress the muscle. Keep in mind that the reason why you subjected yourself to the manghihilot’s painful manipulations is because you want to recover in the soonest possible time. So be sure to go easy on yourself, and don’t aggravate those sore areas. Rest is required so that your body can recuperate. If you had Hilot because of a fracture, rest the affected area to allow healing. Need we say more? If you had Hilot to address digestive system issues, don’t overeat. 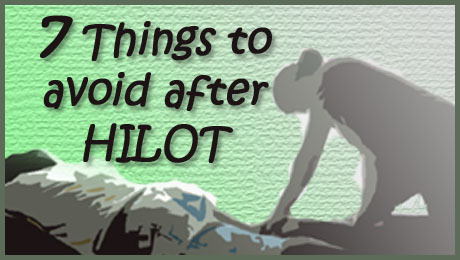 The point of Hilot is to help the body cleanse and heal itself. So don’t overload your system so maximize the effects of your Hilot And while you’re at it, do the next tip too. If you are having Hilot to address kidney and urinary issues, don’t skimp on drinking water! Many people who end up with kidney issues got to where they are because of the lack of drinking water. If you are one of these, it’s high time to make a change in your habits for your own good. The classic recommendation of eight glasses a day is a good ballpark figure, but remember that you may need more or less water depending on your activities for the day, the weather, and the state of your health. So the next time you have a Hilot session, just keep these tips in mind to reap the most benefits. And give yourself a pat on the back for keeping your body healthy with Hilot.